Daily Illuminator: It's Fantastic Martial Arts For Fantastic Fighters! November 11, 2013: It's Fantastic Martial Arts For Fantastic Fighters! 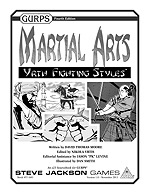 The core GURPS Martial Arts supplement placed an emphasis on realistic and almost-realistic martial-arts campaigns (as have many other supplements). But what about all those other worlds in the cosmos? What are martial arts like on a fantasy world, such as Yrth from GURPS Banestorm? Now it can be revealed, with GURPS Martial Arts: Yrth Fighting Styles. This supplement features more than a dozen armed and unarmed styles specific to Yrth, but suitable for many magical realms. It also includes an examination of how martial-minded advantages and disadvantages work in a fantasy world, plus new perks, techniques, and more. It also provides background on fighting traditions throughout the Banestorm setting, with lots of flavor-rich material that can be incorporated into other settings. Whether you're looking to take your martial arts into new realms or add possibilities to your fantasy game, you're sure to emerge with the glow of a triumphant fighter, thanks to GURPS Martial Arts: Yrth Fighting Styles -- all new, and only available via e23!